HAWAII FISHING NEWS is the official state record-keeper of the biggest fish caught in the state-regardless of the method of capture. To take a look at some of the enormous and unique fish taken from our state waters, click on State Records. Then, there's the Hawaii Granders page. Check out these monsters of the deep and the men who caught them! We also host the elite 100-Plus Club that celebrates giant trevally weighing over 100 lbs. that have been caught from shore on the main Hawaiian Islands. You will not believe these catches. Wow! Plan your tournament activities by visiting our Tournaments site and hooking up with the event coordinators. Hawaii has some of the most lucrative purses in the tournament fishing world and you already know we have some of the greatest fishing and fish! For those of you who keep a close watch on our ocean for your activities, check out the monthly moon and tide calendar on our Almanac page. With the Almanac you can time your ocean activities for peak fishing action. The Charter Boats listing is free and it lists the charter businesses by island, so visitors can plan their trips and correspond with the captains. It's also a great resource for tournament anglers hoping to "cash in" on their trip to the islands. The Info link will take you to a page that will tell you all about HAWAII FISHING NEWS subscriptions rates and other information. Link to the Writers page to learn more about our great writers, contributors, and staff. Jim Rizzuto's three-part series of fishing books are the ultimate source of how to catch Hawaii's amazing variety of sport fish. You can read more about them right here along with information about his wife, Shirley's, excellent "Fresh Catch of the Day" cook book. And don't miss "Hawaii's Offshore Hunters" a book that turns novice fishermen into pros and shows you how to not only catch more fish but how to cut them for the best results! Finally, check out the Links page for information and products for fishing in Hawaii. This page also provides links to ways to connect with HFN online. We're on Facebook and Instagram. GET A FREE HFN ISSUE! 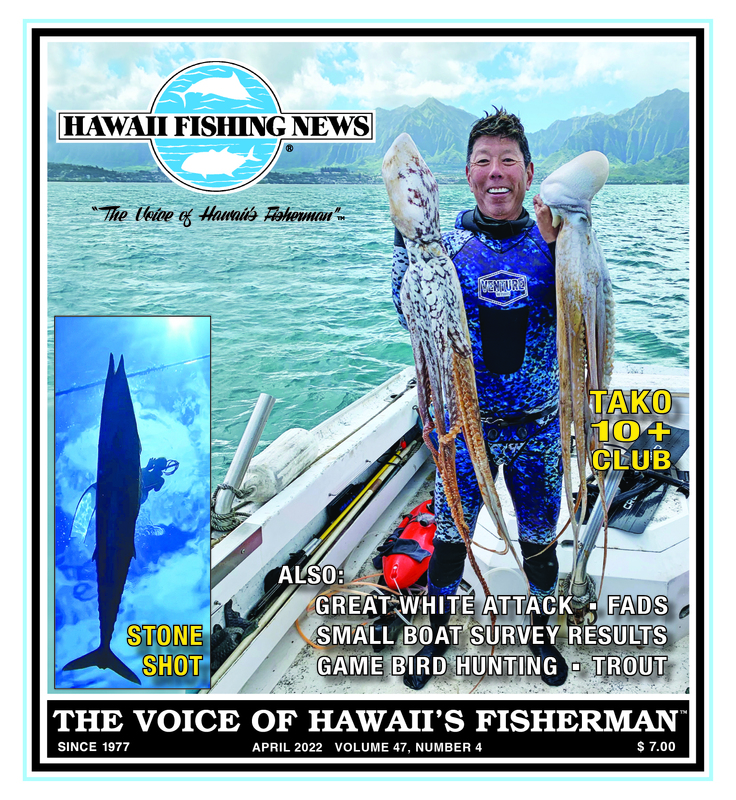 Please know that you can ONLY obtain a subscription for HAWAII FISHING NEWS DIRECTLY FROM HFN via mail or at hfnpublishing.com. For subscription information, click on the "INFO" link on the left side of this page. discover anything suspicious representing Hawaii Fishing News publications please let us know. We're constantly updating our page, so check in any time!